Quality air support is essential in maintaining your thriving criminal empire. With side-mounted miniguns for passengers and a grenade launcher accessible for the co-pilot, the Valkyrie packs more than enough firepower to keep other air traffic off your tail and ensure safe delivery of your precious cargo. And if tearing through the backwoods and kicking up dust is more your speed, pick up the Coil Brawler. Receive both of these heavy hitting vehicles at 25% off through 29th. 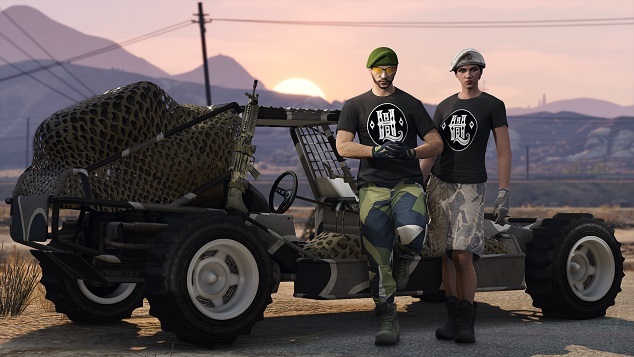 • Time Trial - "End to End"
• Time Trial - "Fort Zancudo"
This week's Boot button Playlist is the Bunker Series, an Adversary Mode Playlist that stages classic PvP modes like Every Bullet Counts, Slasher, and Juggernaut inside the not-necessarily-friendly confines of a Blaine County Bunker. To jump into a Bunker Series when you're already in-game, just set a waypoint to one of the three Bunker Series icons on your in-game map and enter the yellow corona. Updated Bonuses for This Week in GTAO - Snapmatic winners and this week's bonuses.